Irish Car Rentals has designed a car hire return map for Dublin Airport location to guide you back. If you are returning from Galway / Athlone / West Ireland region, you will traveling on the M50. The M50 ring road brings you to the airport depot with ease. If you are travelling from the city center, there are a few routes that bring you to Dublin Airport. The M50 ring road (with tolls), M1 main road or R132 local roads. 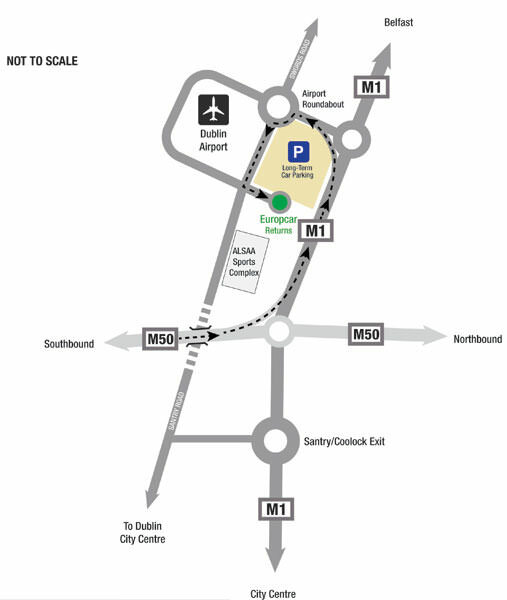 The map below gives you directions to car rental Ireland Dublin airport's depot. Dublin Airport is 10km north of Dublin City centre. Where do I return the car at the airport? You will be provided a rental returns map in the rental pack when you collect the vehicle. When you approach Dublin Airport, follow the rental signage and you will be directed to car hire village. Here you find the following hire companies; Irish Car Rentals / Europcar, Hertz, Budget/Avis offices. Please go to Europcar Dublin Airport depot to drop off your rental. You can return the car at any of our rental locations on request, charges may apply. Our locations are Dublin City, Navan, Athlone, Cork Airport, Galway, Shannon Airport, Kerry Airport and Knock Airport. Once you drop the car off, a staff will greet you and check the car for damage. How much fuel is in the tank and sign you off. You will be transported to Dublin airport terminal 2 by a complimentary shuttle bus. Irish Car Rentals allows a 1 hour grace period at the end of your rental. This means on the final day of your rental we allow 1 hours free rental time. Please note that the starting rental time and date indicated on your rental agreement determines the start of your rental. The grace time is counted from that time not the time you actually sit in the rental car and leave our facility. If you have any questions about car hire in Ireland, please contact us.